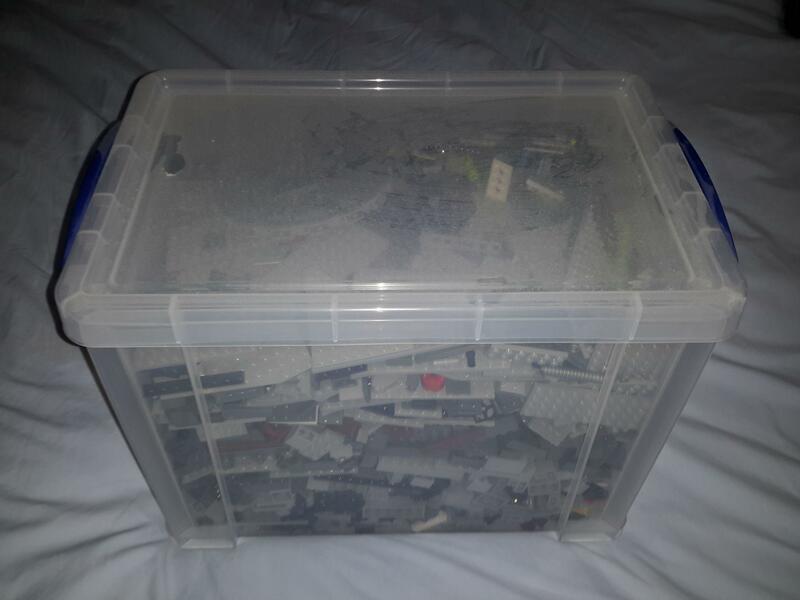 I wanted to get a general idea from the different members of what are the best containers to store open lego sets. Currently I have over 100 Star Wars sets and many are open. I would like to find what is the best containers to store them in. example 7181 a UCS Tie Interceptor I would like to store the set and manual in one plastic bin with lid for storage. Same for my UCS Sandcrawler I would like to set these into plastic storage once I take it apart. So here are my breakdown on set sizes that i would like to get containers to store. and then the mother storeage a set over 5000 pieces. Any ideas and suggestions I am open to. Thanks for reading and helping a new builder/collector figure this out. Welcome to the forum! If you do a search, there have been numerous discussions on the forum about this subject and you may find help in those articles. That said, and apologies if you don't have them in the US, I always use Really Useful Boxes. They are not the cheapest, but when you are storing expensive things like the Death Star or a modular, quality always beats price! They are a UK company but maybe a Bricksetter from your side of the water may be able to advise on an equivalent? RUB's (Really Useful Boxes) are available at Office Depot in the USA (likely elsewhere but I know I've gotten some from there), and yes they are not exactly cheap. Nor will be most any good storage system. Many of the previous storage threads threads are about solutions for storing sets mixed together, it sounds like Gamm would like to store the parts as 'sets'. If I'm wrong than the previous threads hold a wealth of suggestions. Overall if you want to store the parts as sets and NOT in the original boxes I'd suggest Something along the line of RUB's or Sterilite makes a number of lines of plastic storage boxes, aka 'shoe boxes' in a variety of sizes. I'm partial to the ClearView Latch line for a couple of reasons. One, the lid can be latched tight and when it is you KNOW it's not coming off. Two, the sides are fairly vertical and square but there is still enough rounding at the bottom to be able to scoop out small parts. Three, while not the least expensive line they are widely available and cheaper than RUB's. I have nothing against using RUB's the sizes just don't match up with some of my other storage units and replacing it all with RUB's would not be cheap. Especially since I am quite satisfied with the ClearView Latch units and the Stanley 10 and 25 container units with lift out trays. For the smallest sets you can put them in resealable bags (with or without sliders) and then use a larger box to hold the bags. I prefer to use the somewhat heavier freezer bags when I use bags as they hold up over time better, especially if you intend on accessing them frequently. I'm at work at the moment on a night shift, but when I get up after my sleep in the afternoon, I'll check because I have 10188 in a RUB and it fits perfectly, so I'll let you know which box it was. I also use a particular size of RUB for my modular including instructions, so I'll let you know which ones I use for them. Back in the land of living until tonight! I have taken a couple of photos, one with the 19 litre RUB that I use for 10188 and one 7 litre RUB I use for my modulars. 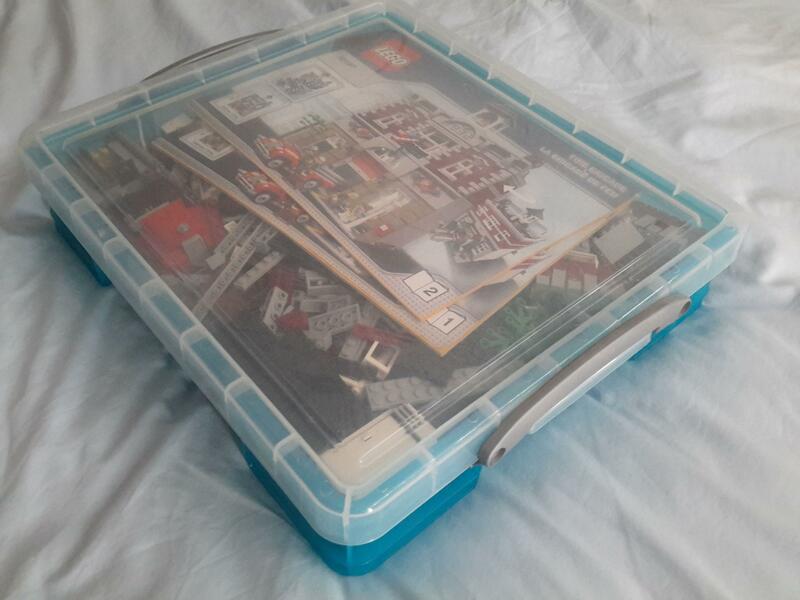 The instructions for 10188 have to be kept elsewhere due to their size. Interestingly, the modulars have definately shrunk (discussed elsewhere) because the Fire Station and Grand Emporium fit just right, whilst the Detective Office and Petshop have a little space left! I like the RUB idea and they are not that bad on pricing from the US website. Just need to find the sizes for the different set I currently have. I am lucky to have a shop nearby that I can go and look at the various sizes of RUB. What I tend to do when packing the set up is break it up first, look at the resulting pile of bricks to gauge what sort of size it is broken up. Then pop to the shop and have a look. A bit long-winded, but it works! I think thats the only way to do it as well. Need to find a local store in Memphis. I think Office Depot may be my one choice. "Sterilite makes a number of lines of plastic storage boxes, aka 'shoe boxes' in a variety of sizes." Pretty much what I use. Some of the cheaper brands use plastic that gets leaves a residue over time. It gets pretty slimey and starts to smell like chemicals. I ditched all of my non-RUB plastic boxes.